The global grow light market is expected to be valued at USD 6.3 billion by 2024, witnessing a CAGR of 11.7% during the forecast period (2018 – 2024). The extensive utilization of indoor cultivation and vertical farming for the production of crops is expected to contribute towards the growth of global grow light market at an extensive rate. Grow light technology is extremely beneficial in lengthening the time frame for natural day light that further exaggerate the growth rate and plant yields. There is several artificial lighting that includes LED lighting, high pressure sodium lighting and plasma lighting that make the crop available throughout the year. Increasing awareness regarding the use of alternative farming in various developed as well as developing economies is expected to further aggravate the growth of the market. Based on technology, the market is categorized into high-intensity discharge (HID), fluorescent, light emitting diode (LED) and others others. HID is further sub segmented into high intensity sodium lamps, metal-halide lamps, ceramic metal halide lamps, combination MH and HPS lamps and others. Moreover, fluorescent is further sub segmented into T5 and CFL (white light and neutral). HID segment is predicted to witness a CAGR of 10.7% during the forecast period. On the basis of installation, the grow light market is segmented into retrofit and new installation. Among these two segments the retrofit installations is expected to contribute larger share during the forecast period. Retrofit installations are usually installed in grow lights when the grow lights are damaged or witness any failure and when the intensity of light drops beneath the anticipated level after routine utilization of these lights. In order to provide their crops with sufficient amount of light to grow the crop growers modify the old grow lights with the new lights of any particular technology to achieve this. It has been observed that when the intensity of light is decreased the grow lights are expected to retrofit it on an immediate basis. There are several innovative grow light technologies that have been recently introduced in the market such ad plasma, LED and induction that has provided the crop growers to choose from variety of available alternatives at the time of retrofitting their grow light systems. Moreover, LED grow light enable large variety of spectrums that make it a viable option to grow large number of crops and is thereby gaining momentum among crop growers and is ultimately fuelling the growth of global grow light market. On the basis of spectrum, the market is categorized into partial spectrum and full spectrum. The partial spectrum category is anticipated to grow at a higher CAGR of 12.8% during the forecast period. The partial lights are extremely useful at various stages of plants growth that emits lights of precise spectrum such as blue, yellow or green. On the other hand, the full spectrum lights emit light that are similar to that of the sunlight and are extremely beneficial for the growth of crops at various stages. The increasing popularity of these two spectrums is thereby exaggerating the growth of thel grow light market. The global grow light market is segmented into indoor farming, turf and landscaping, vertical farming, research, commercial greenhouse and others. Among all these application segments vertical farming is anticipated to witness fastest CAGR of 11.9% during the forecast period. Vertical farming enables growing of large number of plants within a single bounded structure such as in the form of building based and shipping container with the use of controlled environment agriculture and artificial lighting methodology. These structures are rapidly being used by the commercial crop growers to produce vegetables and fruits in all seasons in urban formations. This farming technique ensures fresh crops and at reasonable prices and can be used as an exceptionally greater source for revenue generation from the under-utilized real-estate constructions. Moreover, owing to all these advantages the market for vertical farming is expected to witness rapid growth in the near future, thereby strengthening the growth of global grow light market. Increasing demand for vertical and indoor farming techniques that are extensively using grow lights in order to rapidly increase the speed of crop production; and increasing requirement for constant food supply among the consumers along with increasing popularity among the users regarding LED grow lights are boosting the demand for grow lights in vertical and indoor farms across the globe. Moreover, the government organization of various developed as well as developing nations are propelling commercial growers to use LED lights in order to enable efficient and steady operations that is further pertaining towards the growth of global grow light market. The extensive demand for grow lights growth spaces with ever increasing population is another factor that is driving the growth of the grow lights market. The increasing population is reducing the natural resources and farmlands on a daily basis. According to a recent report, it has been sated that in order to cater to the food requirement of global population the food production must grow by approximately 70% for the next 35 years. The increasing demand for grow lights growth chambers with growing population is another important factor driving the grow lights market across the globe. The world population is growing steadily, while farmland and natural resources are becoming lesser day by day. According to the United Nations' Food and Agriculture Organization, the food production must increase by 70% to feed the global population for the next 40 years. Furthermore, it has been observed that vertical farming and various modern farming techniques will be proficient in fulfilling this ever-increasing demand for food, which is ultimately bolstering the growth of the grow light industry. Implementations of several stringent standards in order to assess the quality of crops grown by grow lights and low quality of light emissions offered by the artificial lightings are the major factors that are hindering the growth of the grow light market. Globally industry players of global grow light market are leveraging market growth through business developments, new product development, technological developments and contacts in order to increase their market share. Geographically, Europe have been contributing largest revenue throughout the estimated period due to increasing awareness related to significance of alternative farming, ever expanding populations and less accessibility of productive agricultural land is expected to fuel the growth of grow light market in this region. 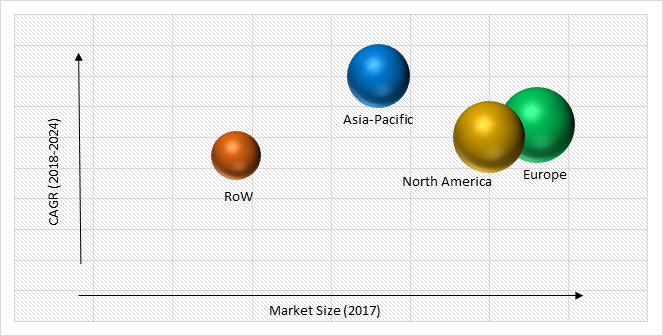 Moreover, Asia-Pacific is expected to further witness the significant growth of this market due to increasing adoption of improved technology of crop. Furthermore, various developing countries in this region are emphasizing upon the development of crops using LED lights that enables efficiency in production of crops and less utilization of energy. These lights further helps in reducing the emission of greenhouse gases and replaces the conventional incandescent light bulbs that are further fuelling the growth of grow light in this region. Some of the key players in global grow light market include Koninklijke Philips N.V., General Electric Company, Osram Licht AG, Gavita Holland B.V., Illumitex, Inc., Hortilux Schreder B.V., Iwasaki Electric Co., Ltd., LumiGrow, Inc., Heliospectra AB, and Sunlight Supply, Inc.
10.7. Iwasaki Electric Co., Ltd.
Table 190 Snapshot – Koninklijke Philips N.V.
Table 193 Snapshot – Gavita Holland B.V.
Table 194 Snapshot – Illumitex, Inc.
Table 195 Snapshot – Hortilux Schreder B.V.
Table 196 Snapshot – Iwasaki Electric Co., Ltd.
Table 197 Snapshot – LumiGrow, Inc.
Table 199 Snapshot – Sunlight Supply, Inc.